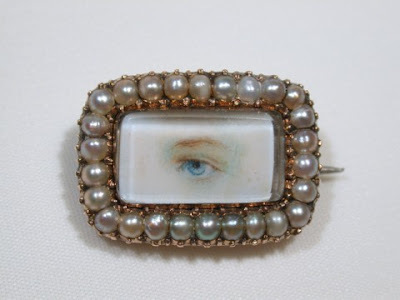 The tradition of exchanging miniature portraits of an eye with loved ones began during the late 18th century. 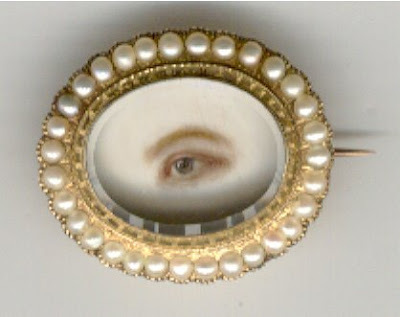 It is believed that the Prince of Wales and his secret lover, Mrs. Fitzherbert, exchanged miniature eye portraits rather than full miniatures so they could have anonymous love tokens. This custom soon took hold and aristocracy began exchanging these tokens of affection. The eyes were set in lockets, rings, and probably most often, brooches. Clever jewelers could arrange it so the eyes were hidden by more sedate representations. A tiny portrait of your patron saint was one popular ploy. This custom lasted from around 1790 to 1825.